Yakima Park Stockade Group, Mount Rainier NP, 1985. The Yakima Park Stockade group, sometimes referred to only as the Stockade, consists of three buildings and a vertical log "stockade" fence enclosing a utility yard. The buildings were constructed between 1930 and 1943, from a design with roots in frontier architecture of the Pacific Northwest. The first building constructed was the south blockhouse, completed in 1930. The building is a wood-frame structure on a stone foundation with log siding. The two-story building is square in plan and has a hip roof finished with cedar shakes. The log siding has saddle-notched corners. The stone foundation wall, which has a stepped batter at the corners, extends to the height of the window sill. The batter of the wall was chosen "to essentially reduce the squareness of the first floor." The second story overhangs the first story and the whole log rafters project from the overhangs. The building originally served as the administrative and interpretive center for the Yakima Park region. Since the completion of the remainder of the development in the 1940s, the building has been used for seasonal housing. The building was remodelled in 1954. During a second remodelling in 1980-82 plumbing and electrical fixtures were replaced, and new drywall, acoustical tile ceilings, and vinyl floor covering were installed. The present cedar shake roof dates from 1976 and is identical in material to the original roof. A few of the projecting log rafter tails were also replaced at the same time. The stockade is a vertical log fence surrounding a small utility area to the west of the visitor center. Large double gates that allow vehicular access are in the north wall of the stockade fence. The stockade originally housed a 1930s utility building which doubled as a mess hall. That building was torn down. A new one-story chlorinator plant of grooved, "split-face" concrete blocks was constructed inside the stockade along the north wall during 1985. The stockade functions well in hiding maintenance and utility paraphenelia that could otherwise disturb the magnificent scenery. The north blockhouse and the visitor center were both started in 1939, but construction was not finished until 1943. The north blockhouse on the exterior is similar in design to the south blockhouse. The building's wood frame sits on a stone foundation wall that extends to sill height. The hip roof is finished with cedar shakes. The logs of the exterior walls have saddle-notched corners and axe-cut ends. The second story overhangs the first and the log beam ends project out emphasizing that overhang. The battered stonework of this building is more regular than that of the south blockhouse. The interior of this building, like the south blockhouse, has been completely remodelled although the exterior remains as it looked originally. The building is used for seasonal housing. The most imposing of the structures is the visitor center, originally known as the "campers' shelter" and then the museum. Its front elevation to the east is flanked and partially hidden by the north and south blockhouses which frame it so masterfully. To the west and rear of the building is the rectangular stockade. An enormous picture window on the building's south wall looks out to the snow-covered slopes of Mount Rainier and provides some passive solar heat for the building. The log walls of this one- and-a-half story structure rest on a stone foundation, like the blockhouses. The logs are saddle-notched at the corners. The gable roof is finished with cedar shakes and it has a ridge log that overhangs both gable ends. Gable ends are finished with vertical log slabs as are the sections of wall between the clerestory windows above the entrance. That entire upper section of wall on the east overhangs the building's first floor, but not to the exaggerated extent found in the blockhouses. The clerestory windows are repeated on the west elevation. New fireproof doors provide access to the building's s main room from the exterior. The exposed roof structure of logs and rough-cut decking provides a rugged appearance on the interior. The pratt-truss logwork supports the roof purlins and rafters above. The trusswork is reinforced with tie rods, undoubtedly necessary because of the heavy snow loads. New spotlights have been attached to the historic fabric on the interior to highlight the interpretive exhibits. Some appear to be placed where original lights were. Suspended acoustical panels were also added to cut down on interior noise. Interior walls are the exposed logs. On a sunny day the most used portion of the room is the south end which is outfitted with a telescope through which a viewer can see parties climbing the northwest slopes of Mount Rainier. At the north end of the main room is an enormous coursed rubble fireplace, added in 1952. The fireplace opening is approximately 4.5x6 feet and holds simple andirons. Behind the fireplace at the north end of the building are two levels of office and storage space, the partitions of which appear to have been moved several times. The new floor of the main room is wood boards laid diagonally. Included in this nomination is the landscape approach immediately in front of the buildings, including the stone curbing and terracing, the stone steps, the paths, and the flagstaff. The Yakima Park Stockade, as it is now known, is a classic example of an exaggerated rustic style. The complex was designed by landscape architect Ernest A. Davidson and architect A. Paul Brown. The complex is a thoughtful combination of natural materials used in traditional forms, thus meeting the standards that were forming within the National Park Service for an architecture suitable to the magnificent scenery of western parks. The buildings were constructed to serve as the administrative offices, living quarters, and community building for the Yakima Park area. The park did have problems funding the ambitious project through the years, so portions were constructed as funding became available. The plans were drawn so that the development could be constructed in three stages. 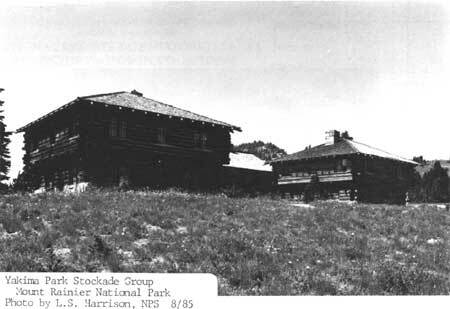 The first unit--the south blockhouse--was constructed during the summer and fall of 1930 as well as a temporary equipment shed (used as a mess hall) within the vertical log stockade. The foundation stones for the blockhouse were brought in from a slide about one mile away. A stand of white pine for the log walls and framing came from the White River area, about 12 miles from the site. The roof shakes were made in the Carbon River district and hauled 80 miles to the site. The south blockhouse, then known as the administrative building had two offices, a living and dining room, and a kitchen on the first floor, and six bedrooms and two baths above. Funding for the rest of the development did not appear until 1939, when Public Works Administration funds were set aside for the construction of the north blockhouse and the community building, then known as the "campers' shelter." Due to further money problems, the buildings were not completed until 1943.
feeling of the low, sub-alpine vegetation to the west and south, and the snow-covered slopes of Mount Rainier as a backdrop gave the development the vast expanse it needed to present that wild, frontier appearance. 1 Ernest A. Davidson, Associate Landscape Architect, Landscape Work in Connection with Development of the Yakima Park Area including approach Highway within Mt. Rainier National Park a report to Thomas C. Vint, Chief Landscape Architect, no date or pagination, circa fall 1930. 2 Erwin N. Thompson, Historic Resource Study: Mount Rainier National Park (Denver: National Park Service, Denver Service Center, 1981), p. 168, quoting from Davidson, White River Inspection Trip, October 28-31, Park Development, Construction Programs, Archives, Mount Rainier National Park. 3 Telephone interview with Merel Sager, retired NPS landscape architect, conducted by William C. Tweed, August 18, 1976. 4 Telephone interview with William Carnes, retired NPS landscape architect, conducted by William Tweed, August 31, 1976. Davidson, Ernest A. Landscape Work in Connection with Development of the Yakima Park Area including approach Highway within Mount Rainier National Park, A Report to Thomas C. Vint, Chief Landscape Architect, no date but probably autumn, 1930. On file at Mount Rainier National Park. National Park Service, Pacific Northwest Regional Office, Cultural Resources Division. Historic Building Inventory, Mount Rainier National Park. Seattle: National Park Service, 1983. Telephone interview with William G. Carnes, retired NPS landscape architect, August 31, 1976. Telephone interview with Merel Sager, retired NPS landscape architect, August 31, 1976. Thompson, Erwin N., Historic Resource Study, Mount Rainier National Park. Denver: National Park Service, 1981. Tweed, William, Laura E. Soullière, and Henry G. Law, National Park Service Rustic Architecture: 1916-1942. San Francisco: National Park Service, 1977. The landmark boundary begins at a point at the southwest end of the plaza, then due west to a point 100 feet west of the stockade, then due north to a point 100 feet north of the stockade, then due east to a point northwest of the comfort station, then due south to the starting point as shown on the enclosed map (omitted from on-line edition).